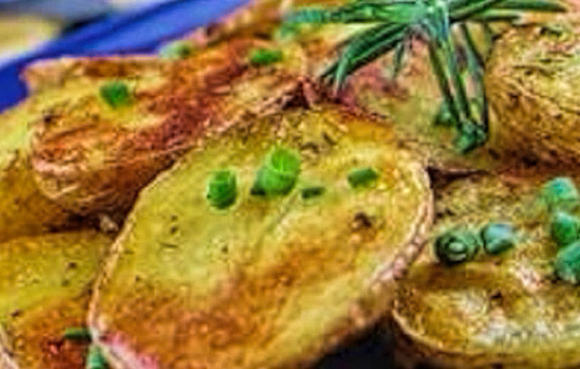 The Best roasted potatoes ever. There is never enough best to double the recipe. Preheat oven to 500 F . Melt butter in a frying pan; add onion and sauté until tender. Halve potatoes lengthwise, then slice crosswise into -thick slices (they will be half-moon shape). Do not put potatoes in water after slicing. Immediately line up in buttered 13x9-inch baking pan with slices overlapping. Pour melted butter over potatoes. Season with salt and pepper. Bake 20 minutes. Remove from oven; sprinkle with Parmesan cheese. Bake additional 5-7 minutes or until cheese is melted and slightly browned. Variations: some like 'em hot! Combine cheese and cornflakes. Sprinkle over buttered potatoes and bake at for 30 minutes, omitting the parmesan cheese.